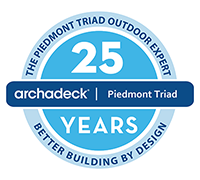 Archadeck of the Piedmont Triad has been locally owned and operated since 1991. We deliver the service and community commitment of a local, family-owned business backed by the strength of a company that’s built 75,000 incredible outdoor structures since 1980. Throughout our 25+ years, we’ve had the pleasure to build second, third and even fourth projects for families who call on us again and again. Some of our repeat clients add new outdoor living areas to their existing home. Many call us when they move to their new home looking to have their favorite outdoor room or deck at their new home. What does longevity mean to you? Longevity is an important factor when selecting a contractor. It’s not easy for a locally-owned company to be successful for a quarter century. From a financial perspective, that company must have survived multiple recessions. From a customer reviews perspective, those must be stellar job after job and year after year. From a referral perspective, the referrals from happy local homeowners must consistently be stellar. The company must be sound in construction, service and management and must delight customers year after year. When you select your contractor, you want to be assured that your project will be completed, that it will be done right and that you have ongoing protection in case anything goes wrong. At Archadeck, we offer 2 protections to every Archadeck customer. The Archadeck protection is the most expansive customer protection plan in the industry. Your project is backed by Archadeck’s written warranty for workmanship of 1 year and structural integrity of 5 years. That warranty is further backed by the National Guarantee Corporation, which guarantees that your residential outdoor living project will be completed to the terms of your Archadeck contract and built to the agreed upon specification and a warranty of performance for up to 2 years. If anything happens to your local office, the national Archadeck office will step in and finish your project as contracted. You can have confidence when selecting Archadeck as your contractor. In addition, depending on the building materials you select, manufacturers’ warranties may apply to protect you against defects in materials. And Archadeck’s intensive training and, in many cases, certification as an official installer help reinforce your confidence that those manufacturers’ warranties won’t be adversely affected by installation issues. Many manufacturer warranties require specific installation techniques to be utilized in order to maintain the manufacturer’s warranty. Archadeck has worked with these material manufacturers for years and years ensuring we have the experience, expertise, training and knowledge to build according to those exacting standards.And in case that isn’t enough, each Archadeck location maintains a minimum of $1 million in liability coverage and full workers compensation insurance (where required by law) to protect you from any possible mishaps. Archadeck of the Piedmont Triad has built porches in every shape, size and configuration throughout the entire Piedmont Triad area. Whether you are looking for a screened porch, a sunroom or an Eze-Breeze 3-season room, choose Archadeck to custom design and build your new outdoor room. When Piedmont Triad area homeowners call on us to help identify the best design and build components of their new room, we work with them to determine the best size, shape, roof style and amenities for their new room. Some important considerations in working together to determine your room design are the orientation of the room to the sun, how much sun exposure the room will receive and how much sun you’d like in your new space. 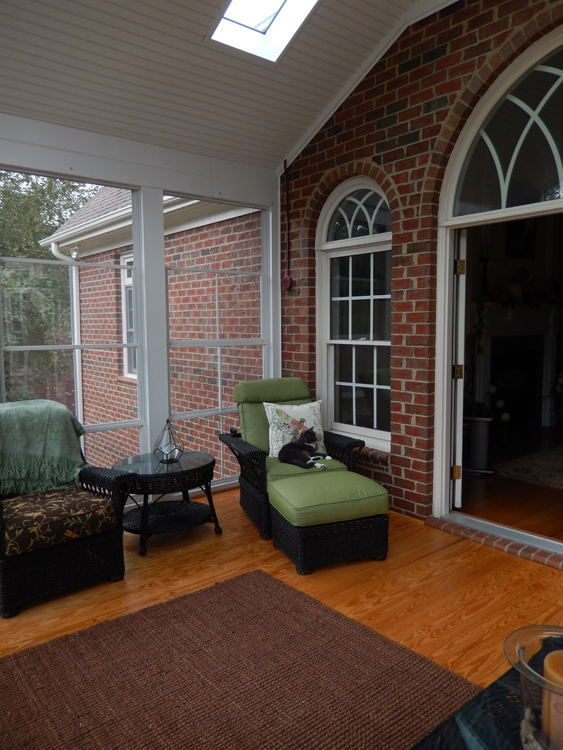 Archadeck can design your porch or 3-season room to accommodate your desire to have a bright and sunny room. Or, if you are looking for some sun relief when spending time in your backyard, we can design your space to achieve some level of sun protection. Thank you for considering Archadeck for your project. We hope to hear from you soon. 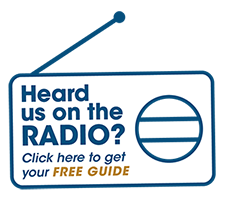 Give us a call for a free consultation at (336) 664-1332. Email us. Or, fill out the form above and we will contact you to schedule your free design consultation. We build decks, sunrooms, screened rooms, screened porches, pool decks, spa decks, gazebos, pergolas, porches, loggias, arbors, privacy screens, fencing, planters, benches, ramps, bridges, walkways, docks, garden structures, outdoor kitchens, outdoor rooms, and much more. Archadeck of the Piedmont Triad is locally owned and in business since 1991. We are backed by the strength of a company that has built over 100,000 incredible outdoor projects. We offer you custom designed and built projects with the strongest warranty. Bradley and I just want to thank you for all the hard work you both have put into our new room! We are beyond thrilled with how it has turned out. Thank you for keeping us informed, keeping everything clean, and just being easy to work with. We look forward to making new family memories in the room! We appreciate everything you have done. Best decision we every made letting Archadeck build our screened porch. Thanks for a splendid job. Love, love our sunroom! Thanks for the great design and finished product. It makes our house perfect. 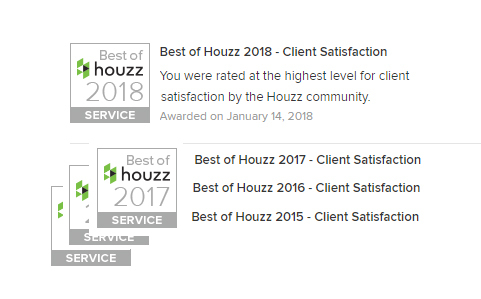 We have been thrilled with the result! Excellent service, always on time. Kept the construction site clean. This is our second time with Archadeck. Would recommend them highly. Great job! Great job! No problems. Professional all the way through and we are delighted with the finished product-we appreciate the designers efforts in realizing our vision. Thanks! Super job, competent consultation. Workmanship excellent. Carpenters worked well together and were very knowledgeable and hard working. The result is a beautiful deck that we are proud of. John Mallard far exceeded our hopes and expectations with the design, consultation and finished room. We love our porch and deck! The project went very well. My wife and I liked the national reputation and guarantee of the company. Both my husband and I hold general contractor’s license, and we were certainly able and capable of building a deck addition ourselves, but we chose Archadeck for the time constraints we had. We both knew what we wanted, what the plans showed, and what we were getting. We watched the carpenters every day, and verified measurements each night. Even with that kind of scrutiny we were very pleased. Your carpenters were wonderful to work with and the most tidy carpenters ever. We are very pleased with our outdoor project build by Archadeck!